Choir School celebrates 50th anniversary with Bishop Uglietto. Published 4/19/2013. Local. The Boston Archdiocesan Choir School (BACS) at St. Paul Parish in Harvard Square opened its doors in 1963 and is celebrating its 50th anniversary with a series of events. The inaugural Mass for the year of anniversary events was held April 14 at St. Paul's. Bishop Peter Uglietto, auxiliary bishop of Boston for the North Region and the principal celebrant of the Mass, is a member of the school's class of 1965. He described how Theodore Marier, whom Uglietto credited with the "dream and inspiration" for the school, came to St. Luke's parochial school in Belmont for auditions. The future bishop was struck by Marier's "infectious and contagious" enthusiasm and he informed his parents that afternoon that he hoped to attend the school the following year. His parents agreed to let him transfer and enroll. Bishop Uglietto explained that Pope Pius XII established the initial vision for Catholic boys choir schools in his 1958 "Instruction of Sacred Music in the Sacred Liturgy" that outlined three reasons for a choir school program: "First, to advance the liturgy with sacred music. Second, to lift the hearts of worshippers through participation in song. 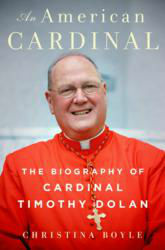 Third, to instill in young men's hearts a generosity to serve the Church either as laymen or as priests." Through Marier's leadership, the Choir School became nationally and internationally recognized within a couple of years. Today, it is the only Catholic boys' choir school in the United States. The school's musical director, Mr. John Robinson commented, on a recent broadcast of The Good Catholic Life radio program, that he hopes to spark a rebirth across the country for this unique form of Catholic education through creating awareness of its 50th anniversary celebrations. 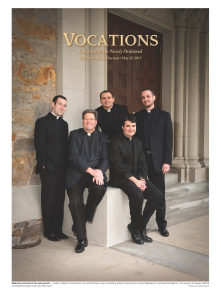 Bishop Uglietto pointed to the school's third objective in mentioning the lay leaders the school has formed and the six men among its alumni who have entered formation for the priesthood. He specifically mentioned that Kevin Joyce, BACS class of 2004, is in his first year of studies at the Pontifical North American College in Rome. Father William Kelly, BACS class of 1976 and a concelebrant at the 50th anniversary Mass, is the pastor of St. Mary Parish in Dedham. Bishop Uglietto thanked the other priests in attendance, Father Michael Drea, Msgr. Dennis Sheehan, Father Jim Savage and Father George Salzmann for their contributions to the school as well as musical directors John Dunn, John Robinson and the faculty that have served the school very well, including current principal William McIvor. "We are grateful for God's many blessings," Bishop Uglietto stated at the end of his homily. "We are grateful for the enthusiasm, energy, and faith in God present in the founders and still evident today in the current leaders. The fuel for the engine of the Choir School today is Mr. John Robinson. My heartfelt thanks go to Mr. Robinson for keeping this effort going. Thank you to the principal Mr. McIvor and the entire staff. We remember all those whose efforts in the early years were so fruitful. We acknowledge the hard work in the middle years. We congratulate the continuing efforts of many to keep the dream alive today." 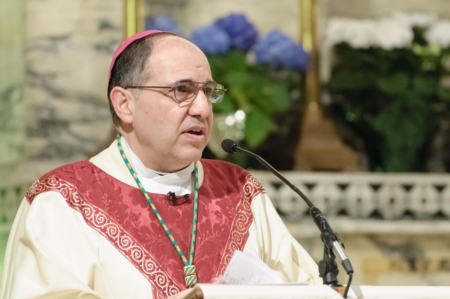 A transcript of Bishop Uglietto's full homily can be read at www.ChoirSchoolParents.com. Upcoming events for the celebration of the school's 50th anniversary involve a Spring Concert on May 19 at 3:00 p.m. and the school's Gala Dinner on June 1, at 6:00 p.m. The dinner will honor BACS advisory board member, Father Robert Reed from Catholic TV, and the emcee will be television news anchor Scott Wahle. More information on both events can be found at www.BostonBoyChoir.org.